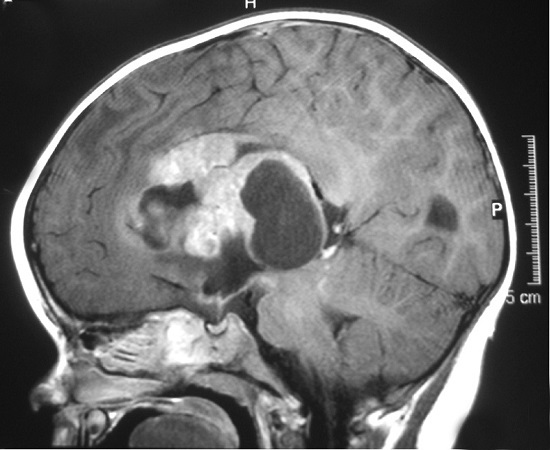 Researchers map epigenetic pathway as target for therapy of aggressive pediatric brain cancer. Working with cells taken from children with a very rare but aggressive form of brain cancer, Johns Hopkins University scientists have identified a genetic pathway that acts as a master regulator of thousands of other genes which spur cancer cell growth and resistance to anticancer treatment. AT/RT mostly strikes children 6 and younger, and the survival rate is less than 50 percent even with aggressive surgery, radiation and chemotherapy, treatments that can also disrupt thinking, learning and growth. AT/RT accounts for 1 percent of more than 4,500 reported pediatric brain tumours in the U.S., but it is more common in very young children, and it represents 10 percent of all brain tumours in infants. The team state that the study also identified new ways in which to treat AT/RT with experimental drugs already being tested in pediatric patients. Because few outright genetic mutations, and potential drug targets, have been linked to AT/RT, the researchers turned their attention to genes that could regulate thousands of other genes in AT/RT cancer cells. Proof Of Concept experiments in fruit flies had already suggested a gene known as LIN28 could be important in regulating other genes involved in the development of brain tumours. Specifically, the LIN28 protein helps regulate thousands of RNA molecules in normal stem cells, giving them the ability to grow, proliferate and resist damage. These factors provide stem cells with characteristics that cancer cells also have, such as resistance to environmental insults. These help tumour cells survive chemotherapy and radiation. These proteins also help stem cells move around the body, an advantage cancer cells need to metastasize. In an opensource study published in the journal Oncotarget, the researchers examined cell lines derived from pediatric AT/RT patients and the tumours themselves. They found that the two members of the LIN28 family of genes were highly expressed in 78 percent of the samples, and that blocking LIN28 expression with specially targeted gene silencers called short hairpin RNAs curbed the tumour cells’ growth and proliferation and triggered cell death. When the researchers blocked LIN28A in AT/RT tumour cells transplanted into mice, they were able to more than double the mice’s life span, from 48 to 115 days. Using selumetinib in cell line experiments, the scientists cut AT/RT tumour cell proliferation in half and quadrupled the rate of cell death in some cell lines. Raabe says the drug appeared to be disrupting a key molecular pathway controlled by LIN28. In a second study, described in the Journal of Neuropathology and Experimental Neurology, the group examined another factor in the LIN28 pathway, called HMGA2, which is also highly expressed in AT/RT tumours. They again used short pieces of RNA to silence HMGA2, which led to lower levels of cell growth and proliferation and increased cell death. Blocking HMGA2 also doubled the survival rate of mice implanted with tumours derived from pediatric AT/RT cell lines from 58 to 153 days. The team summise that their work with LIN28 and HMGA2 should not only lead to understanding why cancers like AT/RT are so aggressive, but also identify their Achilles’ heels. The team state that they have shown that if these key proteins downstream of LIN28 in AT/RT are targeted, the tumours unravel.